It's sleek, quick and keeps everything organized. Forget missing socks who have lost their mates. My house is a Bermuda Triangle of phone and iPad chargers. Between my son, my work and myself, we have roughly a dozen devices. And yet, there’s never a working charger to be found. The tragic one I most recently located was chewed up by the vacuum cleaner and barely works. This leads to a cascade of emotions: frustration, rage, tears and incessant whining. On both of our parts. Enter the Simicore smart-charging station dock, one of those things you'd never know you needed until you had it. It’s like a bookcase or carousel for devices. 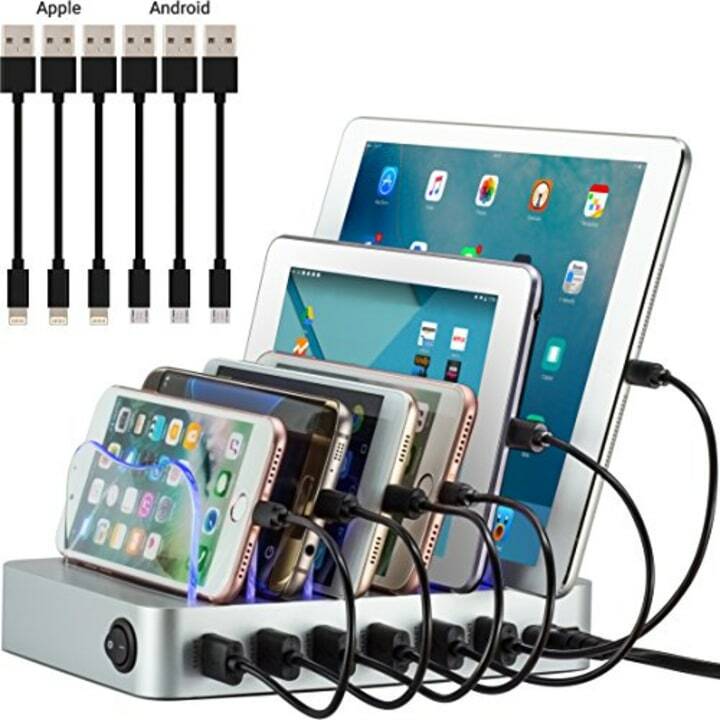 With a single plug connected to an outlet, it can charge up to six Apple or Android devices. It’s really cool-looking (yes, I’m a dork like that), it boasts some great, five-star reviews and when I plug in my Kindle, the station lights up blue to let me know it’s getting power. Also available in a smaller four-port version. And best of all, it keeps phones and tablets out of the bedroom. So when I'm tempted to check email at dawn, it means getting out of bed. Let’s face it, that’s a level of energy I don’t have. Instead of a pile of junk, my electronics now are now neatly stacked and organized. Never again will I experience that maternal nightmare of boarding a four-hour flight with an iPad I thought I'd charged, only to find it was at three percent because of cord confusion.